A nice 4 seasons animated series. Exciting stories prior the Galactic Empire. The funniest story about Rapunzel. Another cool ani-mation by Disney. The funniest robot friend for kids. Inspiring 5 seasons science fiction TV series. . 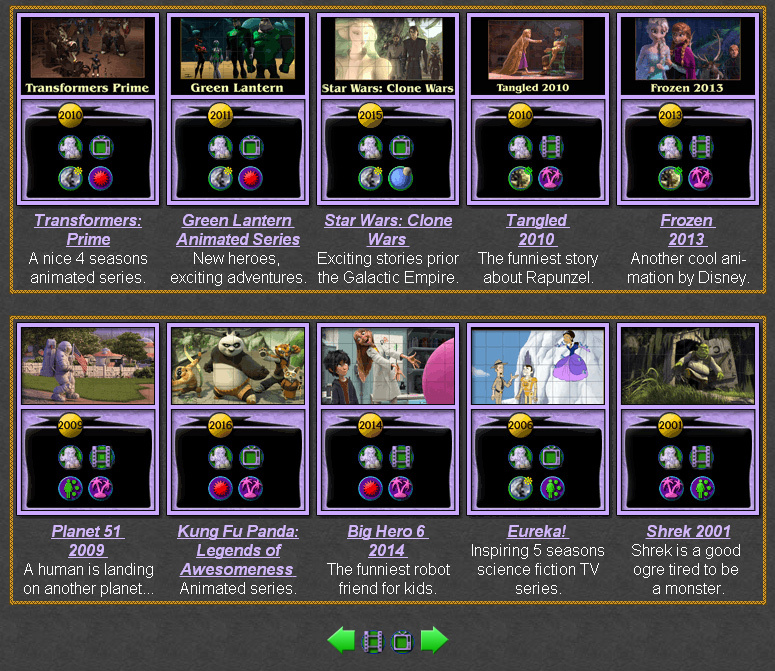 The movie puzzles are small flash games, up to 1 MB, which include a screencast and information about some of exciting animated series, movies and TV series, released through the years. The preview is fast and there is not much for reading, beside some base information about the movie, the genre and the year of release. The movie review may be fun too, as it needs a little interaction, while all pieces of the puzzle are sorted. Fun puzzles with pictures from movies. Transformers: Prime Picture Puzzle - The animated series present a lot of new autobot characters. Green Lantern: Animated Series Picture Puzzle - Meet the powers of red, blue and orange lanterns. Star Wars: Clone Wars Picture Puzzle - The times when Darth Vader was good. Tangled 2010 Picture Puzzle - A funny story about the girl with the long blond hair. Frozen 2013 Picture Puzzle - Exciting story about love and friendship. Planet 51 2009 Picture Puzzle - What if humans were the aliens? Kung Fu Panda: Legends of Awesomeness Picture Puzzle - The animated adventures of the panda. Big Hero 6 2014 Picture Puzzle - Screencast of the science workshop of the heroes. Eureka Picture Puzzle - Inspiring 5 seasons science fiction TV series. Explore exciting movies and TV sries with fun online puzzles. Online puzzles with animated movies and series. The online movie puzzles may be useful too. They include reference for some of the most popular movies, or not so popular for some, but still worth watching. All puzzles can be played online in a web browser. They will run in most computers, tablet and laptops, with installed flash player on it. This is an interesting way to learn about some good movies and TV series. Every completed movie review also give a new +1 Knowledge Level for now knowing about it.